On the Disk Partitioning Setup screen, select Remove linux partitions on selected drives and create default layout from the pulldown list. The /boot partition resides on its own non-LVM partition. In the following example, it is the first partition on the first drive (/dev/sda1). 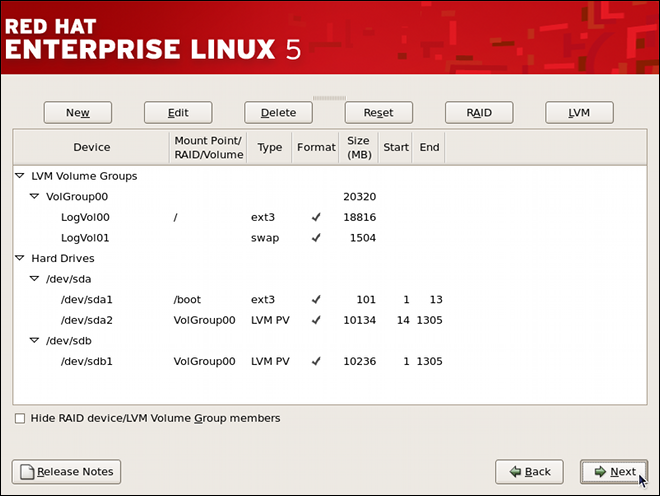 Bootable partitions cannot reside on LVM logical volumes. If enabling quotas are of interest to you, it may be best to modify the automatic configuration to include other mount points, such as /home or /var, so that each file system has its own independent quota configuration limits.